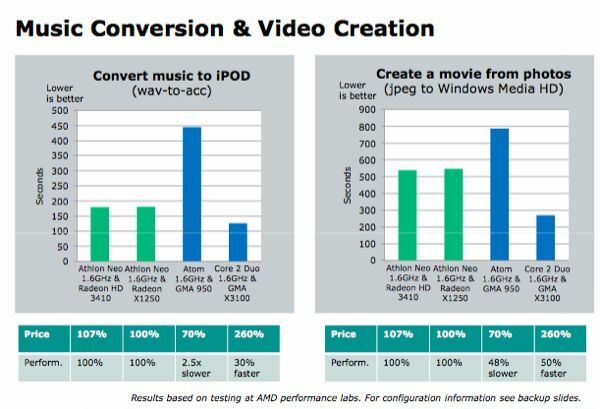 And here you thought AMD's 45-nm Conesus was its next generation netbook / ultra-portable processor. Sorry, for that you'll have to wait until the beginning of the second half of 2009 according to Bahr Mahony, Director of AMD's mobile division who we just spoke with here at CES. Instead, AMD's Athlon Neo ultra-portable platform built around existing 65-nm processes is scheduled to make its retail debut in the US in March. Remember, AMD won't be challenging Intel in a race to the bottom so Neo is aimed squarely at that soft, chewy marketshare nestled between the underperforming $499 netbook and over-the-top $1,499 ultra-portable. Neo boasts more processing power than Intel's 45-nm Atom at the cost of a higher load on your battery thanks to the 35W thermal envelop of the Neo chipset combined with a discrete, ATI Mobility Radeon Hd 3410 graphics. The result however is what AMD calls balanced performance from ultra-thin notebooks capable of smooth 1080p playback of your HD media -- a feat that Atom-based netbooks saddled with integrated graphics struggle with. Interesting, now let's see the 3rd party benchmarks. AMD's data versus the Atom posted after the break.